It's not often you're linking to the New York Times about a new climb being put up. If this is the future of media as it moves online, I'm sold - incredible animation/detail to go with great writing. "More than anything, I want to top out together," he said. "We gotta make that happen. It would be such a bummer to finish this thing without Kevin. I can't imagine anything worse, really." As for back-story, another read well worth your time is on National Geographic giving Tommy Caldwell's history and backstory including being kidnapped on an expedition and chopping off the end of his own finger in a home-work accident. "So our celebration of this extraordinary achievement is tempered by the knowledge that for better or worse it's the end of an era of exploration that began in earnest with the post-war achievements of climbs such as the Lost Arrow Chimney...."
However, if you really want to get an understanding of the Dawn Wall and where it really all began, Peter Beal's post is the must-read. It'll most likely only be relevant to climbers (and not the mainstream) but it touches on some truly interesting ideas. "......On the Dawn Wall, as on most of El Cap, we are climbing over ghosts and relics of a bygone age, tiptoeing past the presence of those who came before, a striking number of whom are dead or no longer climbing at all. We share the rock with this past but it's time we also recognize that the present has a claim on this place. The old definitions of adventure may yet apply but in ways that we have yet to recognize. As I have written elsewhere, the temptation to mythologize and idolize the past is especially strong in climbing. 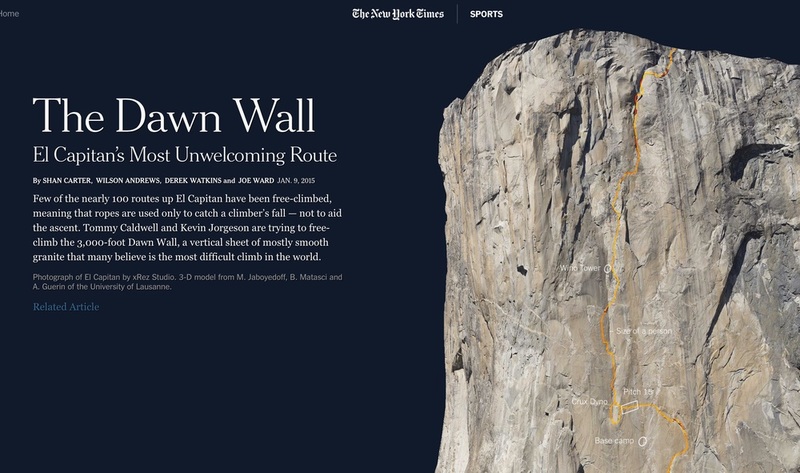 The Dawn Wall reminds us that a new era is always just around the corner."